When executed well, outdoor lighting can greatly enhance the architectural detail of your home exterior and highlight landscape features, presenting your home in the best possible light. And, if your home is on the market, landscape lighting also adds value to it. For instance, an investment in outdoor lighting for upper-bracket homes can yield a 50% return. The reason why buyers, or your guests, appreciate homes with good outdoor lighting is not only because of aesthetics but, more importantly, because of the security it gives – against intruders and accidents, such as tripping or falling. Here are some useful tips in helping you plan and install your home’s landscape lights. 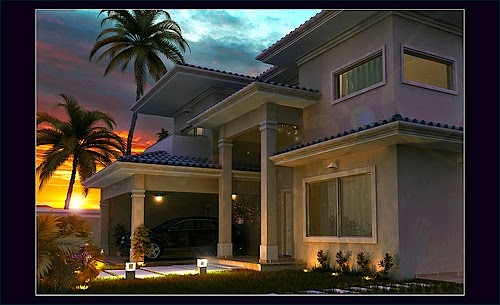 The key to effectively and beautifully lighting your home at night is to achieve a “moonlight effect”. Instead of aiming to illuminate the entire exterior of your home with bright light, plant lights strategically to emit that natural looking shine on particular features that you wish to highlight, as well as areas that will need illumination so that it is safe for you, your family, and your guests to walk around and towards your home safely while at the same time keeping it safe from prowlers. Create a dramatic effect with uplighting but remember to use it in moderation. It’s a great way to highlight trees and other architectural and landscaping features. Add uplights to plantings along a pathway to break up the “runway” look of having too many lights lined up alongside a walk. The main door is usually set as the center stage. Wall sconces or pendant lights on both sides of your home’s main entry add a welcoming appeal for your guests. You many also choose to have a flush or semi flush mount lighting fixture just above the door. Although the primary lighting would come from spot and flood lights, installing a few other light fixtures such as area lights, step lights, bollards, or post lights create a beautiful scene aside from adding security to your home. While there is a wide array of hues available for lighting, using a single shade of warm white light all throughout your home exterior makes for a sophisticated and appealing facade. Remember, you are showcasing your home and its outdoor features, not hosting a lights show. Orchestrate with a timer and set your outdoor lights to start as the sun begins to set and turn off at midnight, leaving only the security lighting on. Automating this task keeps you from forgetting to turn your exterior lighting on or off at night and also ensures that there is outdoor lighting even when you are out or on a vacation. Motion-detecting security lighting installed near the garage, stairs, and pathway can help ensure safety and prevent falls and other accidents. In terms of security, this also helps keep intruders out. Another advantage would be its energy efficiency, as these are only activated when there is someone within the area and instantly turns off when you leave. Outdoor lighting goes beyond showcasing your home and your landscape features. More importantly, it serves to ensure your safety and security. It pays to plan carefully and invest in the right lighting fixtures so that you are guaranteed to have a beautifully lit home at night that keeps you safe and secure. About the author: Joan Silver is a known lighting expert from Capitol Lighting (1800lighting.com) and a fan of all things “lighting”. She currently provides customers and designers with robust information on their lighting needs.